What do the new features feel like in use? Logic Pro X 10.1 is a free update for existing users. 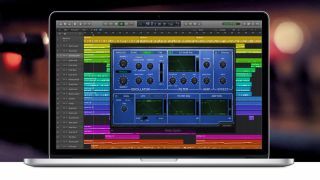 NAMM 2015: We've got to grips with Logic Pro X 10.1 here at the NAMM Show, and it's clear that lots of users will benefit from this update's new features. The new tools fall in line with Apple's progressive model, which nurtures novices from their early days with GarageBand through to the advanced features of Logic, progressing users through the Apple music-making ecosystem no matter what level they're at. As an electronic music maker, the several new Drummer styles and dedicated Drum Machine Designer plugin are perfect for on-the-fly beat generation and programming. The latter is evocative of Ableton Live's Drum Rack, with the ability to load any sample or third-party instrument per-pad - although we simply used the new tools to lay down dance drums in a flash. The new tools fall in line with Apple's progressive model, which nurtures novices from their early days with GarageBand through to the advanced features of Logic. Like Live, the Piano Roll can be condensed down to view only the drum channels you're working with - a simple but nifty feature that long-time Logic users will appreciate - and MIDI events can now be highlighted and 'timestretched' using time handles. We also had fun painting notes with the new Brush Tool, adding note repetitions, stutters and rolls with the Note Repeat tool, then punching in gaps in these repetitions with the Spot Erase tool. We'll have more on Logic Pro X 10.1 in due course. In the meantime, you can get an overview of the new features on the Apple website.